Roman Week: Doctor Who - Looking Back At THE FIRES OF POMPEII | Warped Factor - Words in the Key of Geek. Andrew East returns to Pompeii. And so we return to Pompeii and the devastating eruption of Vesuvius, only this time we are accompanied by the 10th Doctor and Donna Noble. The ‘new’ TV series has never been shy of trampling over much of the ‘extended’ universe of Doctor Who creating problems for those fans who like their Doctor Who ‘canon’ to fit neatly together. 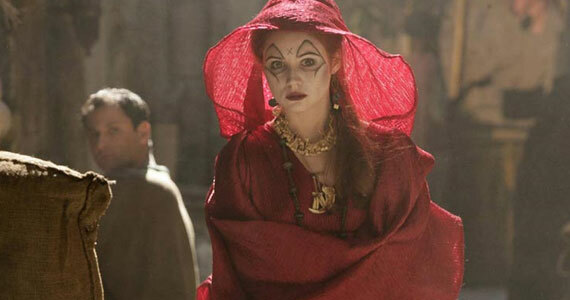 However, unlike the two versions of Sally Sparrow or the fact that the 7th and 10th Doctor’s have both taken on human form and taken up a teaching post in a boy’s school in the early part of the 20th century, The Fires of Pompeii – intentionally or otherwise – manages to avoid clashing too greatly with Big Finish’s original visit in The Fires of Vulcan. It is feasible that both the Doctors and their respective companions are running around Pompeii amidst the death and destruction and with everything that is going on never actually have to cross paths. 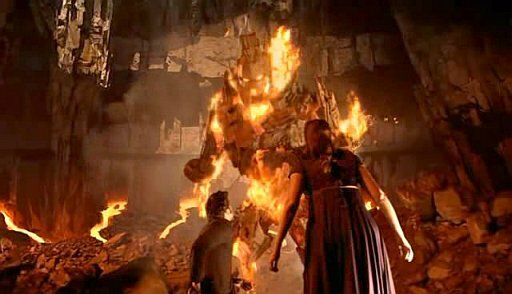 The Doctor and Donna arrive in what they believe to be Rome (with a nice nod back to The Romans with the Doctor's comment about the Great Fire) until Donna points out the whacking great volcano towering above them. 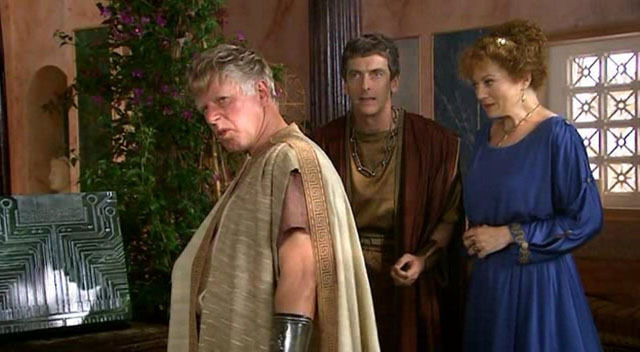 Finding the TARDIS has been sold (by an unconvincing ‘Del-Boy’-like Phil Cornwell) they track it down to the house of Caecilius and his family. It is here they begin to discover that something odd is happening to the soothsayers of Pompeii and that there is an alien presence under the earth. The Pyroviles are changing the Pompeiians to stone and plan to take over the Earth. In contrast to ‘purely historical’ The Fires of Vulcan, The Fires of Pompeii is what is usually classed in fandom as a ‘pseudo-historical’; meaning that a historical setting is presented but the story revolves around alien interference. And that is what I don’t like about The Fires of Pompeii. The plot, I feel, cheapens the horrific events of real life. In The Fires of Vulcan there is a terrible inevitability to the unfolding events – something which the Doctor and Mel can do nothing about except survive. In The Fires of Vulcan, it transpires that Vesuvius’ eruption is at the hands of the Doctor. I know that the Doctor has been revealed as the driving force behind many historical disasters – the Great Fires of Rome and London, for example – but the majority of those cases are accidental or more directly linked to an alien presence. 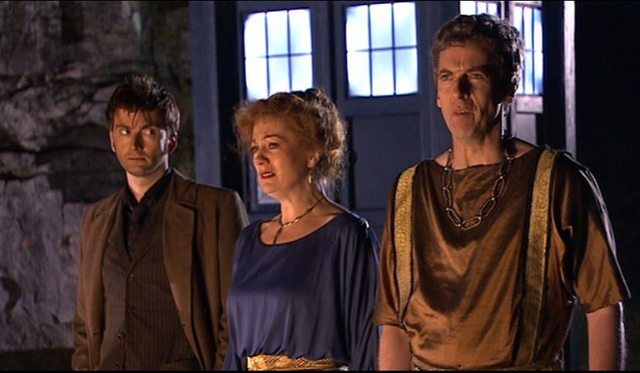 Here the Doctor is given the choice – save Pompeii or save the world. His choice is obvious but it just leaves a bad taste in my mouth. Aside from the irony that the 7th Doctor’s predicament is at the hands of his future self, I don’t really like this version of events and would much rather the presence of the Pyrovillians had nothing to do with the eruption itself. The Pyroviles themselves are a good-looking CGI creation, but really give little to the plot. Their mouth piece, Lucius Dextrus, serves to explain the plot but I really don’t like Phil Davis’ performance. It’s a very monotonous delivery and it never feels as if Davis is putting an awful lot of conviction into the role. There is, however, much in this story to enjoy. Catherine Tate is wonderful as Donna and her anger at the Doctor over his unwillingness to save anyone from the disaster is convincingly portrayed. It’s a nice continuation of Mel’s determination to not let Pompeii be the end for her and the 7th Doctor. The comparison does suggest that Donna is more compassionate than Mel – caring for the others more than herself – but when you consider that Donna knows exactly where the TARDIS is, unlike Mel, and that the 7th Doctor is more than happy for Mel and himself to save the lives of people such as Aglae and Valeria, this difference is understandable. The family of Caecilius – Peter Capaldi, Tracey Childs, Francois Pandolfo and Francesca Fowler, are good fun and tread a fine line between traditional ‘Shakesperean-like’ performance and a more modern twist. Indeed, overall this story plays around with the common perceptions of a historical story. Rather than go for the serious ‘ancient civilisation’ delivery and direction of other Who historicals, The Fires of Pompeii opts for a more ‘modern’ approach with riffs on teenage sibling rivalry, patronising stereotypes of the Welsh (there’s lovely) and a scene involving the old ‘you’re not going out dressed like that…’ speech from a long-suffering father. Donna is also given a fair share of knowing dialogue like TK Maximus. This does contrast a little oddly with the very serious performances of the Sybelline Sisterhood (including a very unScottish Karen Gillan) but overall works to make the story just that little more ‘real’, at least by a modern audience’s standards. Pompeii looks amazing and the destruction at the end is convincing and affecting. The only part that doesn’t really work is the scenes set at the foot of Vesuvius which look as if they were filmed in Wales (which I assume they were) and jar badly with the Rome-filmed scenes. Historically, this story covers much of the same ground as The Fires of Vulcan, the only differences being this story steers clear of some of the more salubrious aspects of Roman society and concentrates only on Caecilius’ family and the soothsayers (tied, as they are, into the ‘sci-fi’ element of the story). Of the two visits to Pompeii, I think The Fires of Vulcan will always win out for me. The slight flippancy I feel creeps into The Fires of Pompeii and the ‘Vesuvius Explained’ plot mars it a little, plus the rehabilitation of Mel adds another element to the audio that makes it a little bit more satisfactory for me as the audience.